I read the other night that the caterpillar changes its skin about four times before it moves on to encasing itself in a chrysalis. Each time the caterpillar sheds its skin, its skin becomes more interesting. 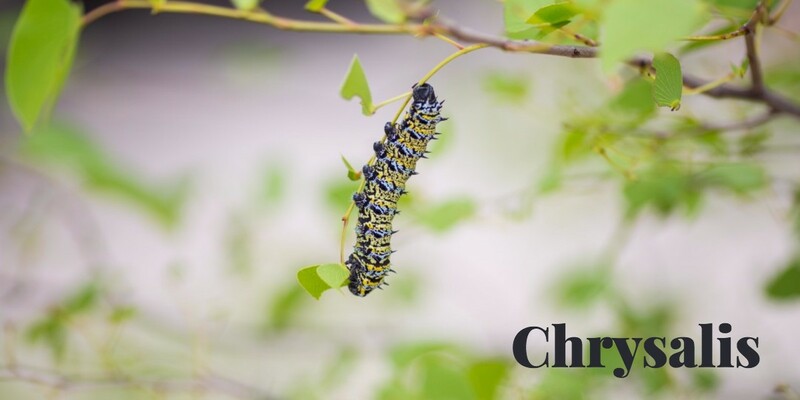 (1) Then eventually the caterpillar finds a safe, protected place, sheds its skin one more time, and that skin becomes a harder and harder casing that we know as the chrysalis. (2) It is in this hard, protective casing that the caterpillar becomes a butterfly. This is where I have been the last year. About a year ago, God began tying many pieces of my life together to point out some core false beliefs and broken patterns that He wanted to free me of…things I’ve lived from all of my life and to a varying degree in most of my relationships. So, I asked Jesus to break apart these broken patterns and make me new. I had no idea the year He would walk me into so that I would become new. This breaking off of that old “skin” came through my own health struggles, new parenting challenges, personal limitations, rejection, facing false beliefs and fears, and seeing myself honestly. This breaking off of the old “skin” continued this way for about six months until I attended an incredibly powerful emotional healing training (click here). Attending this training was the moment I identify as my chrysalis becoming complete…God using that experience to create a safe, protected space for me to go forward into the massive changing He was about to do in me. And that’s where I’ve been since. In my chrysalis. God is doing some incredible things deep in my heart, in my little family, in how I live my everyday life, in how I care for myself, in how I interact with others, and in how I step into my place and call in His Kingdom. But all of these changes have been protected and hidden in a safe place. They haven’t been out in the open this time. Six months ago, I knew it was time to pause the blog. I’ve written here some about a few things I wanted to share with you over these past few months, but honestly there is so much being overhauled inside me that it’s just too much to share out in the open. I’ve written so openly in the past about all that God was doing in me and my life, much like the caterpillar shedding its skin over and over again out in the open for all to see…with small yet amazing changes happening each time…giving glory to an amazing Creator. But now…this chrysalis season is something different. What I know, though, is that Jesus is overhauling me. He is breaking off the things that are not of Him so that I can ultimately live reflecting more and more of His original design. It is in this place of deep transformation that I am currently living…quietly, safely, hidden, protected…so that when it is time, I will be able to break out ready to fly. Thanks for hanging in there with me as I live this chrysalis season! (1) Turnbull, Stephanie, Caterpillars and Butterflies, p. 13. This is the day to begin. You’ve felt the prodding in your heart. There’s that habit that you just can’t shake…no matter how hard you try. That secret you’ve never told anyone…but are beginning to wonder if it’s affecting you more than you thought it could. Those patterns that you learned in childhood as “normal” but are becoming destructive in your life and relationships now. These things that subtly haunt you, trap you, and weigh you down. This is the day to acknowledge that they are there…and that you want to dismantle them. Don’t worry. You don’t have to completely dismantle them today. But do decide today to take the steps toward dismantling them. Every single one of us is impacted by patterns we learned in childhood, wounds we received along life’s journey, and our own propensities to veer away from God’s best for our lives (i.e. sin). These three things affect us more than we realize. Unattended to, these are the things that dismantle the very hopes and dreams we have…the very health and wholeness we long for within ourselves, in our relationships, and in our connection with God. All too often, we just keep functioning within failing frameworks because it’s familiar. It may not be healthy, it may not be whole, it may not even be remotely hopeful…but we trudge on because it’s familiar. But what if we stopped. We if we said we were done with the familiar flawed functioning? What if we said we wanted more? What if we stepped out, took a risk, and pursued wholeness of soul? Sure. It might be entirely destabilizing. We might even feel like the rug is being pulled out from under us. But what if in the end, we found our footing on a ground more solid than anything we had previously known. What if our whole lives could be different? What if God could change you? What if you could feel hope? What if you could feel whole inside yourself? What if you could pursue health in your relationships, connecting meaningfully with those you love most, dismantling your destructive patterns and replacing them with life-giving ways of relating? What if Jesus could actually transform you? These “what if’s” are worth doing the hard work of the soul. And today is a great day to deicide to engage this work. Making the conscious decision to deal with your soul is always the first step. Take it. See a therapist, go to counseling, join Celebrate Recovery, attend The Journey Training, schedule a SoZo session, talk to a trusted friend, read a book, tell the truth…tell the truth…tell the truth…say what’s inside that you’re too afraid to admit but desperately need to say if you’re ever going to be whole. Surrender yourself to Jesus’ overhaul of you. Tell Him what’s not working, what’s hurting, what’s broken. Because He is the only one who can truly and fully heal, change, free, and make whole. You will never be able to do it on your own. Do it for your marriage, for your kids, for the Kingdom…do it for yourself. Take a step toward wholeness of soul. It could change the rest of your life. * Paraphrase of Isaiah 61:3 found in the song, “He Gives Beauty for Ashes” by Crystal Lewis. I just completed the second of two weekends at an experiential training that could best be described as an emotional and psychological healing boot camp. While at the training, I was given the opportunity to basically see my naked soul in a mirror and process all that I saw. It was intense, raw, unconventional, vulnerable, hard, and incredibly healing. After just the first weekend, I described to Val that it felt like my soul was unraveling…it felt like a really good and necessary unraveling…all kinds of false paradigms that I’ve lived under throughout my life coming undone...and while good and necessary, it still felt like an unraveling. And unravelings are never easy. I had signed up for this experiential training because I knew someone who had been through it and I had seen her truly change…I had seen her become freer and more confident. I saw my friend embrace and run with her God-given design in a way that I hadn’t quite seen so fully expressed in her until this point in her life. I also have this dream of seeing women know their own story and become reconnected to their God-given design, so I signed up for this training just so I could know whether or not I could, in good conscience, recommend it to others as a tool of sorts toward that dream of mine. I had no idea how God would actually use it to overhaul me. The first weekend truly let me see myself in a crystal clear mirror. My soul. My emotions. My patterns. My false paradigms. My struggles. My strengths. Me. In a mirror. The first weekend also gave me some new tools to incorporate into my life as I saw these things about myself. Over the month in between the two trainings, as I connected with God over these false paradigms, He began to unwind many of them. Some of these false paradigms I’ve been living under for as long as I can remember, while others had come into play as recent as four years ago. I began taking them one at a time, praying over the specific one, asking God where it came from, asking Him for His truth over that paradigm, and ultimately asking Him to heal and reset what was false into what is true. As I got closer and closer to the second weekend, God begin pulling forward memories that I hadn’t thought of for years. I knew He wanted me to pay attention, to find themes, to remember where some of my patterns and beliefs began. So, I did. I engaged with Him, because this process was way outside my comfort zone and I needed to know that it was Him walking me through every step of the way. In fact, this training was so outside my comfort zone, so incredibly vulnerable that I considered not going to the second weekend. But after some encouragement from my friend, and a deep sense inside myself that I needed to see this process through to the end, I went to the second weekend. Now on the other side of that second weekend, I feel like I have been given an incredible gift to have been able to go through this training. God used this training to bring me face to face with some things I desperately needed to let go. And at the same time, He used it to call me forward and reclaim some of the things I had lost along the way amidst life’s struggles. In fact, over the course of the last few years due to some deep wounding, I had stopped trusting. The love and support I felt through this training, combined with the power of the Holy Spirit, dismantled that wall. 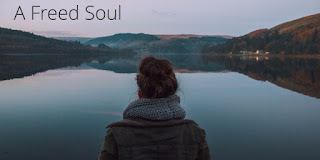 In the rawness of soul, facing myself as I truly am, as I engaged with God throughout the experience, I found myself reconnected with my design and realigned with who God made me to be. There is nothing like being reacquainted with who you truly are, the false paradigms unraveling, your soul reawakened, your whole self reengaged. I feel like I am a stronger, more peaceful, more present mom…more self aware, more able to find my calm in the chaos than ever before…and more able to really connect with my kids. I also feel like I’ve got a new tenderness and love for Val now, too. Honestly, I feel like I’m a revived woman. Not just going through the motions of life, carrying all my responsibilities, trying so hard to do a good job, but breathing, loving, present, me. After experiencing such a profound impact through this training, I wanted to tell you about it! This training is for anyone, whatever your background…whether it be traumatic or not. It’s for men, women, young, not as young…anyone. However, this training isn’t for everyone at this very moment…it would be something you would have to want to do. I will tell you this: if you come to a place where you want to see yourself honestly and be realigned with who God designed you to be, this experience is precisely what you want. The training itself is definitely unconventional, yet it is this very characteristic that makes it so effective. The best way I could describe the training is that it is like a counseling session on steroids in a group setting done through active learning experiences, direct teaching, open sharing, and personal processing. I will also tell you that it is possible that there could be parts of the training you may not agree on a philosophical or theological level. As you face those, discern those for what they are without letting them negate the training all together. If you can do that, this experience could be one of the best tools you ever gain in life. Also, while the training is led by Christians, the training itself is not a faith-focused training per se. In fact, the training primarily deals with emotional and psychological healing…and it is up to each participant to take it to the spiritual level if he or she so desires. For me, because I chose to engage the training on a spiritual level, I experienced a powerful and personal spiritual healing connected to my emotional and psychological experience. I believe that the deepest healing and lasting change will come when you engage your spirit with the Spirit allowing Jesus to do the work of truly changing you. However, this is still a phenomenal and powerful experience simply at the emotional and psychological levels! If after reading all this, you feel a longing in your heart for this kind of shift in your own life, I’d encourage you to check out The Journey Training website (click here). If you decided to go through this training, you would ideally sign up for “Threshold” and the “Crossroads” that follows it the very next month so that you go through the experience with mostly the same group of people. If you have any questions or just want to know more, please contact me (click here). While I’m not personally affiliated with The Journey Training, I’d be happy to answer whatever I can from my own experience! If you ever do sign up to go through this training, please let me know (click here), I’d like to be as much of an emotional support through your process as I am able. This past January, God placed a dream in my heart to walk with women through their stories for the purpose of reconnecting them to their God-given design. This dream began after a season of seeing what a significant impact a mothers’ soul health plays in the lives of her children…whether a healthy soul bringing about a life-giving impact or an unhealthy soul bringing about a detrimental impact. As I’ve listened to so many people’s stories over the years, the thread of the mom’s impact began to be highlighted and magnified. It seemed as I listened more intently to others’ stories, often a person’s season(s) of greatest pain occurred during a time in childhood or adolescence when the mom wasn’t emotionally healthy. More specifically, it seemed that either direct or indirect hurt (whether emotional, physical, or otherwise) occurred in a person’s story when his/her mom couldn’t deal with life on some level during a season in that person’s childhood or adolescence. Let me pause there. Just so you know the truth and to caution us from engaging judgment and condemnation: we all, each one of us, can’t deal with life on some level and to varying degrees at various points in our lives. The pattern I saw in these people’s stories, though, was simply that the moms had seasons of not being able to deal with life yet didn’t pursue transformation or healing of the issue or struggle in the “can’t deal” seasons, ultimately cascading hurt onto their children. As I saw this, a dream began. What if, in my generation, I did what I could do to prevent this pattern from spreading? More specifically, what if I could sit with women and hear their stories and help them connect the dots in their life stories of God-given design and life themes to pursue, lies that are believed that need to be overhauled with truth, and wounds that need healing. What if we could identify the “can’t deal” places and find healing and hope and tools for those? What would happen if we could connect the dots of our stories and not be stuck in the “can’t deal” places, not be bound by the places of pain and struggle? What would happen in our own selves? What would be the cascade into our children’s lives? Envisioning the ripple effect of moms living life connected to their God-given design, living from truth (and not from lies), and ultimately living with healthy souls is so, so beautiful to me. So, I began to engage this dream. I began to pray and pursue training in these areas. And as I began, I also had a sense that God would want to start this process of maternal soul health with me. And He has. I did not expect the intensity of the process He would begin taking me through this year. Yet, it makes sense…how could I take women somewhere I hadn’t first gone myself. So, I’ve been engaging the process He has me in, facing anything He unfolds in front of me. It’s been a soul-healing year for sure. Destabilizing at times. Unfamiliar often. But new and better and hopeful and restorative always. This past weekend, I went to an interactive training on emotional healing. It was incredibly intense and way “outside the box”! In fact, I am still trying to discern how I feel about the training. What the training did, though, is let me see myself with a new depth of honesty. While humbling, I will forever be grateful for the opportunity to look at myself with such clarity. It was like looking at my soul in a mirror. After such an intense experience and seeing myself with such clarity, there are many things now to process with God, for me to pray through, for me to ask Him for further transformation and healing. I feel slowed in my life. Which is actually a really good thing for me…a slowing of all the drive, ambition, productivity, and accomplishing to sit still, listen, and heal. So, I will be taking the next six weeks (at least) as a blogging sabbatical. I will be stepping back and spending time engaging my soul with God and seeing what He has planned in this process of Him guiding me into my own “maternal soul health.” For these next six weeks, I will let the blog be silent but didn’t want to do so without letting you all know why. So, will you pray for me as I engage this process? And will you also pray for the dream…the hope of one day being able to walk with women into their own stories so that they, too, have soul healing and become reconnected to their God-given design? Why I Won't Be "Growing My Kids God's Way"
life as worship by Katie Tramonte is licensed under a Creative Commons Attribution-NonCommercial-NoDerivs 3.0 Unported License.